Codenamed Axon Multy, the foldable device that might launch as the ZTE Axon M in less than three weeks is rumored to feature twin full HD displays that turn into a massive 6.8-inch touchscreen with a resolution of 1,920 x 2,160 pixels. The touchscreen slate form factor has been around since the first iPhone arrived and it will stay for at least a few more years. 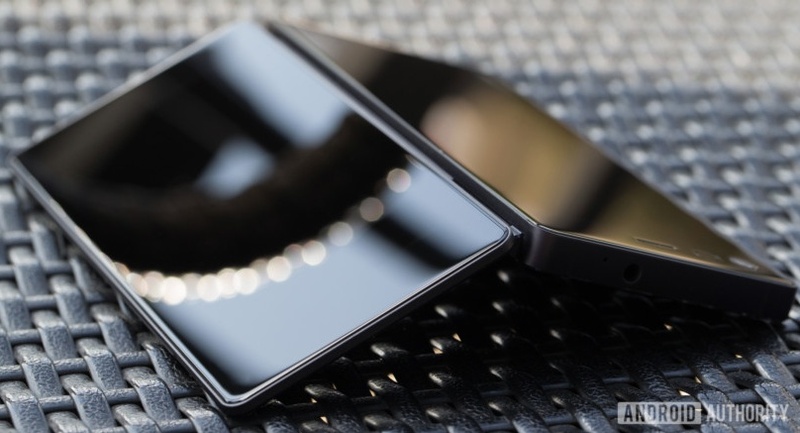 Modular attachments and smaller bezels or no bezels at all are nice improvements to this old design approach, but foldable smartphones are the next step in terms of both design and functionality. Yesterday, Android Authority published an exclusive image of the upcoming ZTE Axon Multy foldable handset that is expected to hit the market as the ZTE Axon M. The image reveals that this upcoming device uses a design approach that has been seen in a commercial product way back in 2011 when the Kyocera Echo was introduced. According to the most recent rumors, the foldable ZTE Axon Multy features two full HD touchscreen displays that fold out into a single 6.8-inch touchscreen with 1,920 x 2,160 pixels. Just like the Kyocera Echo, the Axon M is expected to function as a typical smartphone with a single display when folded. In addition to the display setup mentioned above, some early leaks also revealed a few other technical specs of the ZTE Axon M. They seem a bit outdated, so we suggest you to take them with a grain of salt: Qualcomm Snapdragon 820 (no typo here, the rumor is really about the old Snapdragon 820 MSM8996 processor that was announced back in December 2015), 4 GB RAM, 32 GB internal storage, a single rotating 20 MP camera, and a 3,120 mAh battery. Considering the large display, it would not be a surprise to see the Axon M shipping with a second battery like the Kyocera Echo. The Kyocera Echo landed in the US back in mid-April 2011 as a Sprint exclusive and has been advertised as "the first dual-screen smartphone." Its two 3.5-inch TFT displays with 800 x 480 pixels each provided four usage modes: single screen, tablet, optimized (each display shows a different part of the same app), and simul-task (a different app is shown by each display). The ZTE Axon M could launch on October 17 as an AT&T exclusive handset. The price tag? About US$650, but we should wait for its arrival to be sure.